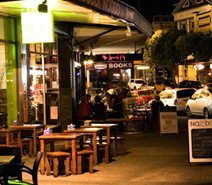 The Business Directory lists some 70 business names being the majority of the businesses in the compact district at Perouse Road and St. Pauls Street intersection. The Spot is a secondary shopping zone that, in a changed shopping environment, has found a ″raison d′etre″ to exist, expand and prosper. Following on from revitalization of the Ritz Cinema in the mid 1900's the area, in its heritage form, has emerged as a key leisure and services centre catering to the people of Randwick and the wider eastern suburbs. It is a family-friendly precinct. Fine Cuisine is our philosophy here at the spot, follow your nose down perouse road end enjoy what we have on offer to our diners with true blue value and freshness. Real Estates, Shops, Medical and Accounting, Judicial and financial services if what your seeking doesn’t exist, then its more than likely just up the road. What are you doing today? With hair, health and beauty are equally important and, unlike skin and make-up; there is absolutely no possibility of covering up the lack of good health. Whether you are new to the community or a long time resident, looking whats around is now easier than ever before.